Eminem has been in the news ever since he released his newest album Kamikaze where he took shots at several artists and media personalities. 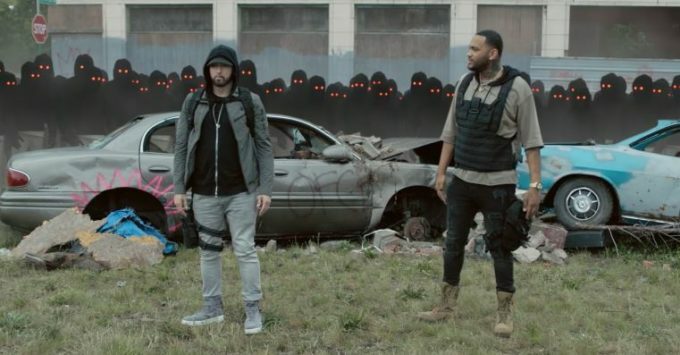 Kamikaze has been a commercial success, debuting at number 1 on the Billboard 200 with sales of 431k and looking to repeat the top spot for the second week. Em has already dropped a video for ‘Fall‘ but he’s now back with the visual treatment for the Joyner Lucas-featured ‘Lucky You’. The song has been a fan favorite from the album so far, debuting at number 6 on the Billboard Hot 100 chart this week so it’s a good choice to push it with a music video. Just like the audio, the video is crazy too — watch it below.